Or really, lack thereof. 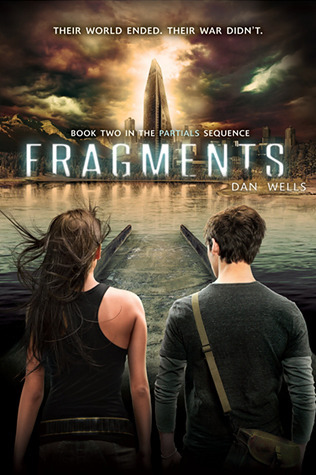 I just finished Fragments, the second book in The Partials Sequence by Dan Wells. Let me put my reaction to this series this way: when I got home from work, I asked The Professor if I could borrow her library card so I could pick up Ruins. Why I didn’t get it while we were at the library last weekend, I don’t know. If you’re not familiar with The Partials Sequence, I wrote a little about Partials (book 1) after I read it. Basically, scientists created biosynthetic humans who have better sight, hearing, sound, ability to retain information, strength, etc. Humans used Partials to win a war against other superpowers. Then the Partials, who wanted rights, rose up against the humans. Finally, all of the humans started dying from a virus called RM. Now you have where the first book starts. What I love about the series is how it calls into question people’s humanity. I mean, take Samm for example. He is a partial, but he clearly cares about Kira. Does the fact that he’s a partial mean that he is less human? It’s dystopian, but it’s also a vehicle for conversations about humanity and what it really means to be human. As a member of more than one minority group who has had to (or is) fighting for laws to be created that remind others that we’re human too, I feel for Samm and the partials. I feel for Kira who is struggling with identity: being a partial, but having grown up in a human community. And I also feel like, as science advances, we need to start having conversations about artificial intelligence, biosynthetics and whether or not the Cylon-like creatures we create will rise up against us because we fail to fully imagine their complexities. I’m hoping to get to Ruins soon, and I’m excited about it. I’ll probably be back with more thoughts then.